Cutting sod has never been easier. 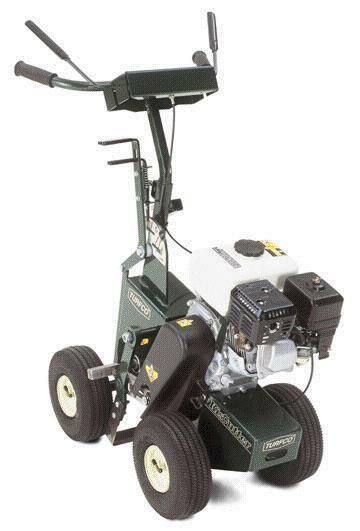 The KisCutter is the most maneuverable, easy-to-use sod cutter available for landscape professionals. The KisCutter s light weight and easy hauling make the KisCutter ideal for a variety of sodcutting jobs, from sculpting lawns and flower beds, to trimming ball fields. The innovative four-wheel design with pneumatic tires and variable speed rear-wheel friction drive provide excellent maneuverability on virtually any terrain, along with the ability to cut up to 9,000 square feet per hour. Four-wheel design, pneumatic tires and rear-wheel drive make this the most maneuverable, easy-to-use sod cutter on the market. Revolutionary lightweight design cuts as much as heavy, 300 lb. units. Lower vibration reduces operator fatigue. Easiest sod cutter to transport. Optional 9-inch blade available for curbing. * Please call us with any questions about our cutter 12 inch sod turfco rentals in Tulsa OK and neighboring communities in Northeastern Oklahoma.